Hello and cheerio from Poznan, Poland! Doug and I are here for a few days, visiting with the saints who are gathered here for a conference on apologetics and another conference the next day on family. On our way to Poznan we got to sight-see in Berlin and Lutherstadt Wittenberg. Our hotel in Wittenburg was right next door to Luther’s house, which is now a museum with an impressive collection of old (and I mean old) Bibles as well as first-edition copies of Luther’s tracts. It is all very new territory for us, and we’re enjoying being the foreigners in a strange land. Or is it stangers in a foreign land? Either way, we are thanking the Lord for our tour-guide, Bubu, who is the CREC pastor here in Poznan. He speaks German, Polish, and English, so we have had a very easy time of it. Berlin was interesting, Wittenberg was fascinating, and Poznan seems an entirely other world. Look at this picture of the square in the Old Town, and you’ll see what I mean. But the colors in the picture are very muted compared to what they are in broad daylight. Wish you were here! Wow, I wish I were there too! 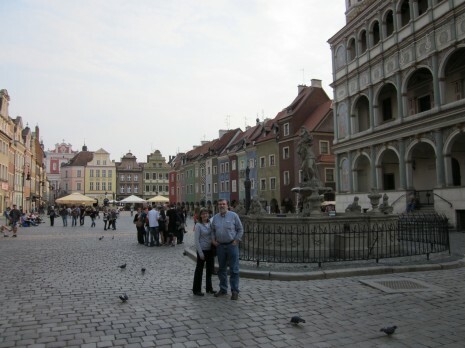 🙂 I went to Poznan (and other parts of Poland) in 2009 and loved every minute of it. Isn’t Bubu a great tour guide? The colors are a big part of what I miss about those areas – if you spend a winter in northern Europe, though, you get to understand why you’d want a bright palette on all the buildings. Enjoy your time and may the Lord bless the conferences and do a mighty work in Europe. Cze??! Lovely to see a sunny, colorful Polish street! (My memories of living in Poland were gray, gray, gray, and more gray! Winter clearly wasn’t the best time of year to form a favorable impression of the Polish cityscape.) Enjoy your trip! I thoroughly love Poland and go there every year to see my in-laws. I hope you have a wonderful visit! Thanks for sharing, and enjoy the rest of your trip. Oh my, cobblestone streets and a rainbow of townhouses – so lovely! Hope you have a beautiful time. I love Poznan! And my former church there, which was organizing those conferences. Aww… I wish I was there now. I’m jealous that you got to see all that neat Luther stuff. We are hoping, my husband and I, to get to Germany for the 500th anniversary of Luther’s 95 Theses, but I wouldn’t be sorry to get there before then. lol Being Lutheran ourselves, this is a dream trip. Looks like you’re having a super time! Can’t wait to hear more about the trip.